I sometimes see it flying in and out, and here it is at rest. This entry was posted on December 15, 2010, 4:58 pm and is filed under aircraft, around the airport. You can follow any responses to this entry through RSS 2.0. You can leave a response, or trackback from your own site. It followed me home…may I keep it? Its cute with its little friend. I wish you’d moved that APU out of the way…little friend or no. And I wish stupid wordpress didn’t make me confirm by following a link every time I subscribe to a post. While I’m being cranky, I wish you’d take me off moderation. No reason, just ’cause I’m cranky. I bet *you* made that stud pull out. The toaster said you did and it would never lie. I’m looking in to it. Its not immediately clear to me how I can make a “preferred customer status” condition for comments. But then again I’m not the sharpest blogger in the shed. If its still on the pad today, and if I drive by that way, I’ll see if I can’t get another shot. And who knows, maybe another of VIH’s fleet will be in. Its getting to be a “at the airport” regular feature. Makes you suspicious of the designers. “How much of that is functional, and how much did you do just to make it look cool?” Or maybe “cute” instead of cool. It’s like the PT Cruiser of helicopters. Fly it?…Hug it?…Fly it?…Hug it? I can’t decide! The Ka-27 was designed to replace The KA-25. The first prototype flew in December 1974. Variants include the Ka-27PS search and rescue version and Ka-28 ASW model. The Ka-29 combat/transport helicopter and Ka-31 surveillance variant are in operational service. The primary function of the KA-29 Helix B amphibious assault helicopter is delivery of percision-guided weapons, weapons designation, and troop transport. There are two versions of the Ka-32 helicopter: transport Ka-32T and shipborne Ka-32C. 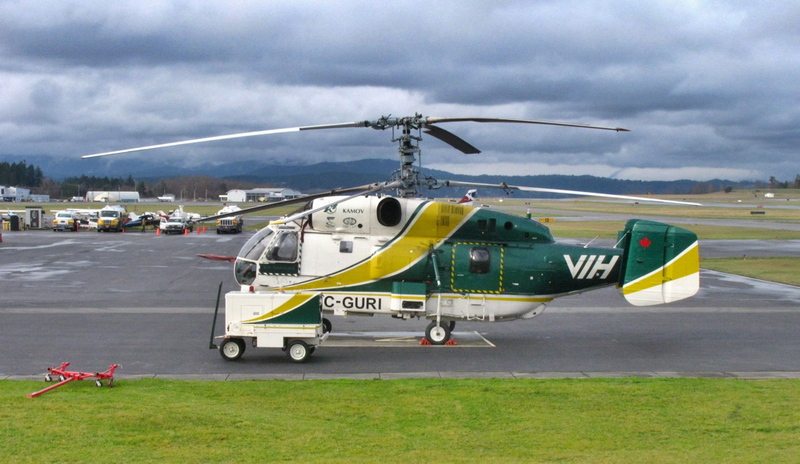 The Ka-32T version is designed for cargo and passenger transport both inside the cabin and externally on a sling, logging in hard access areas, to fulfill civil engineering and installation work, construction, search/rescue missions, medevac and off-shore oil rings servicing operations and various types of aerial survey. The Ka-32C version is designed for carrying out ice prospecting during the steering of the convoys of ships, their unloading, performance of rescue operations at sea and acting as ambulances. The Ka-32 has two TVZ-117 turboprop engines which provide higher power and safety under extreme conditions. I had a model of a Kaman utility helo as a kid and it was dead cute. That’s the one with the interleaved rotors side-by-side. I think it’s the short-and-fat aspect (pun intended) that contributes to the cuteness factor. And I keep getting Kaman and Kamov Kamfused in my mind. Russian naval vessels have often been quite beautiful, much more so than US ones. Especially more than some of those slab-everythinged horrors we’ve built lately. Just wanted to point out that the builders don’t call it a Helix — that’s a NATO designation where all helo names begin with H, bombers with B, fighters with F etc. I’m amused at the rough cost of a million five plus four tenths of a mill.